This re-working of Pink Floyd’s legendary album is dope! (Listen to a sampler here.) It’s also work-friendly, as I like to say. You know, the kind of music you can listen to at work without it taking your concentration away. Great for background. Now is your chance to see this album performed on tour as Easy Star All-Stars will head out on tour of a special anniversary edition of this classic album. Put out by Easy Star, the leading independent reggae label, the re-issue will boast new artwork, an in-depth liner note booklet, and two bonus tracks, including a new version of the song “Breathe” featuring additional vocals by Eric Rachmany of Rebelution, Metric Man, and Ruff Scott of the Easy Star All-Stars. The huge success of Dub Side of the Moon (2003) spawned a popular series of reggae tribute albums by the band including Radiodread (2006), Easy Star’s Lonely Hearts Dub Band (2009), and Easy Star’s Thrillah (2012). 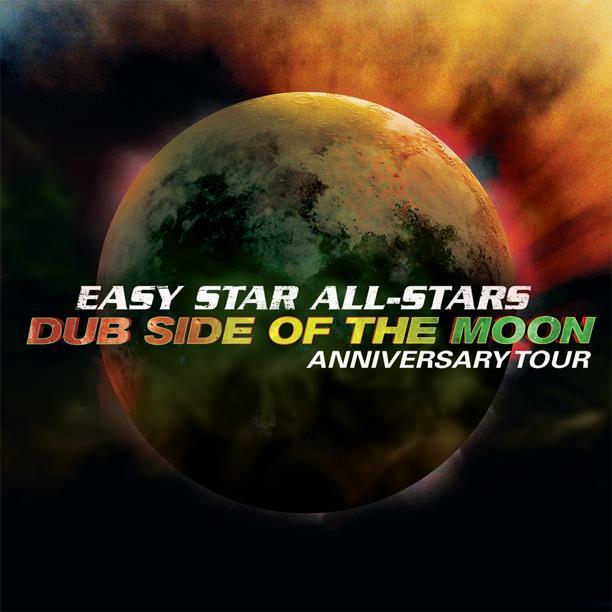 The Easy Star All-Stars have also released an original EP (Until That Day, 2008), an original album (First Light, 2011), and a remix of Dub Side called Dubber Side Of The Moon (2010). They have toured worldwide over the past decade, playing in over 30 countries on 6 continents. This spring the band hits the road for the Dub Side Of The Moon Anniversary Tour performing the album live in its entirety alongside classic material from the band’s career including original songs and tracks from the other tribute albums. Select shows will also include new animated visuals that were debuted at live shows in November 2013. The tour features a number of great pairings as well, including five co-headlining shows with John Brown’s Body (including the third teaming up for 4/20 weekend at Brooklyn Bowl), two shows with Ted Sirota’s Heavyweight Dub, and four shows with Rochester’s celebrated Thunder Body. Don’t miss them!